Here is the AlexWarp applet by Alex Rosen http://www.axlrosen.net/, made famous by the Bush-Gore Distort the Candidate site. 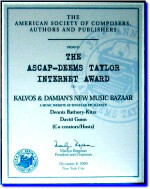 Composer for May 2002: Daron Aric Hagen. Distort him! Composer for March 2002: Eve Beglarian. Distort her! Composer for May 2001: Guy de Bièvre. Distort him! Composer for March 2001: James Bohn. Distort him! Composer/performer for January 2001: Margaret Lancaster. Distort her! Composer for December 2000: Dennis Báthory-Kitsz. Distort him!